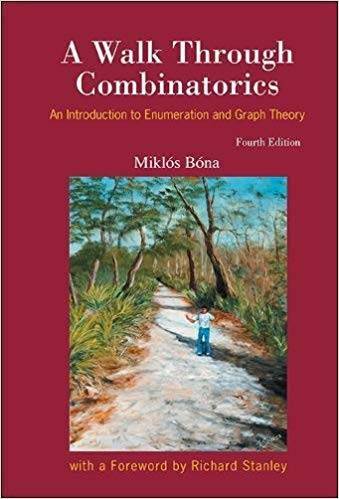 Miklos Bona, "A Walk Through Combinatorics: An Introduction to Enumeration and Graph Theory, 4th Edition"
This is a textbook for an introductory combinatorics course lasting one or two semesters. An extensive list of problems, ranging from routine exercises to research questions, is included. In each section, there are also exercises that contain material not explicitly discussed in the preceding text, so as to provide instructors with extra choices if they want to shift the emphasis of their course. Just as with the first three editions, the new edition walks the reader through the classic parts of combinatorial enumeration and graph theory, while also discussing some recent progress in the area: on the one hand, providing material that will help students learn the basic techniques, and on the other hand, showing that some questions at the forefront of research are comprehensible and accessible to the talented and hardworking undergraduate. The basic topics discussed are: the twelvefold way, cycles in permutations, the formula of inclusion and exclusion, the notion of graphs and trees, matchings, Eulerian and Hamiltonian cycles, and planar graphs. New to this edition are the Quick Check exercises at the end of each section. In all, the new edition contains about 240 new exercises. Extra examples were added to some sections where readers asked for them. The selected advanced topics are: Ramsey theory, pattern avoidance, the probabilistic method, partially ordered sets, the theory of designs, enumeration under group action, generating functions of labeled and unlabeled structures and algorithms and complexity. The book encourages students to learn more combinatorics, provides them with a not only useful but also enjoyable and engaging reading. The previous edition of this textbook has been adopted at various schools including UCLA, MIT, University of Michigan, and Swarthmore College. It was also translated into Korean.